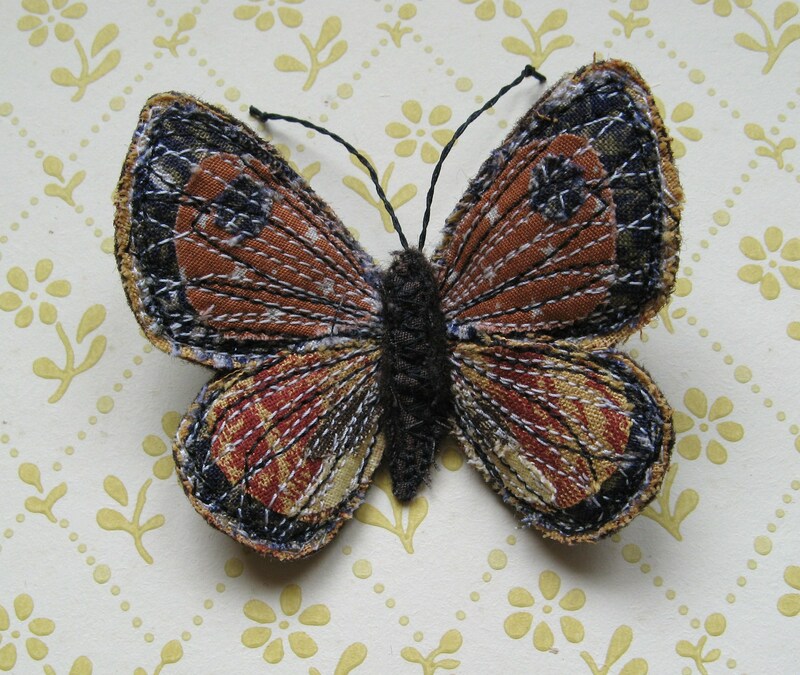 I`ve been working on some new butterflies this week. 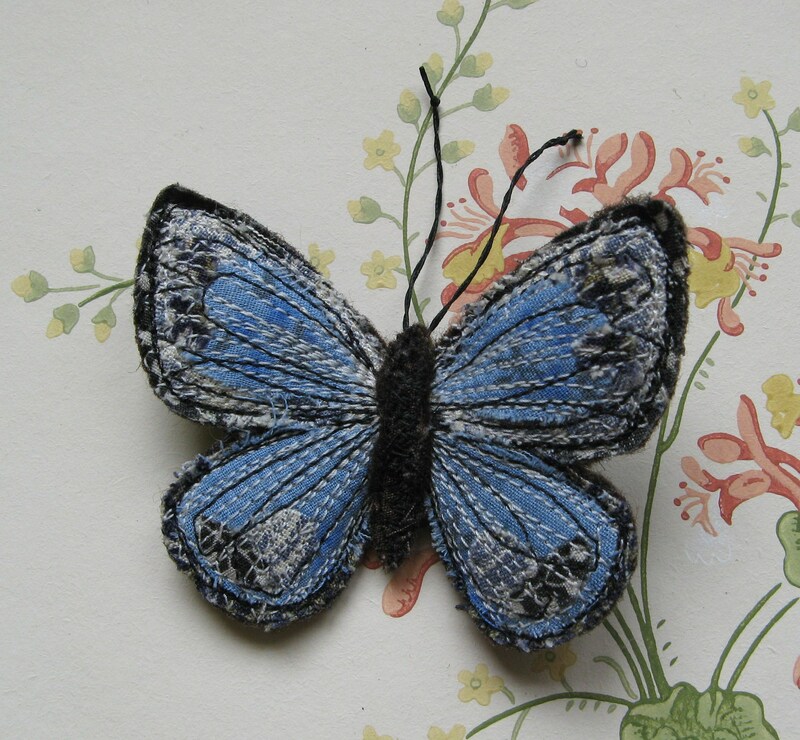 I wanted to make a freestanding butterfly brooch that would give the impression that a butterfly had just landed on you for a moment. 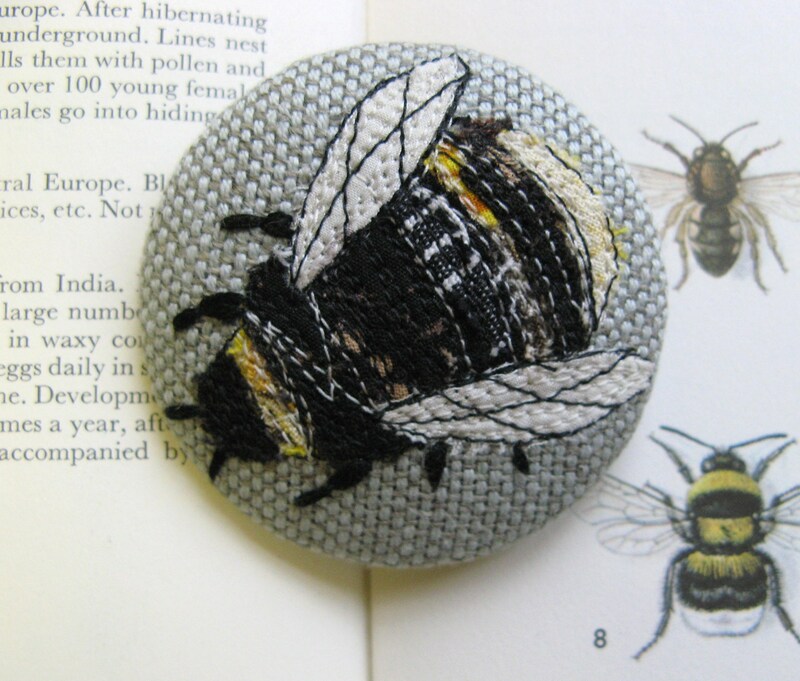 I looked closely at illustrations in my butterfly book and tried to make the brooches as realistic as possible, painstakingly snipping out tiny pieces of fabric before stitching the into place. 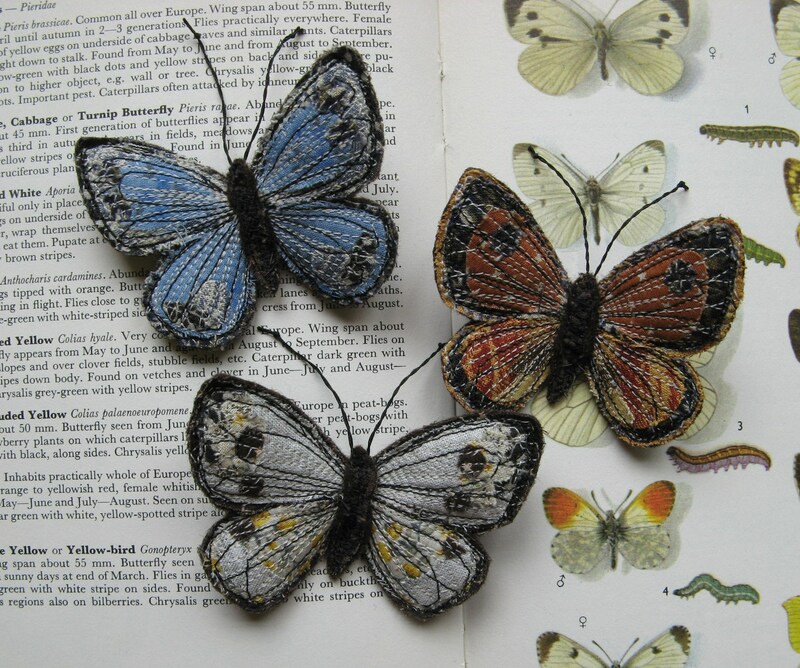 These are based on Large White, Clouded Yellow, and Large Blue butterflies (with a little bit of artistic license…). 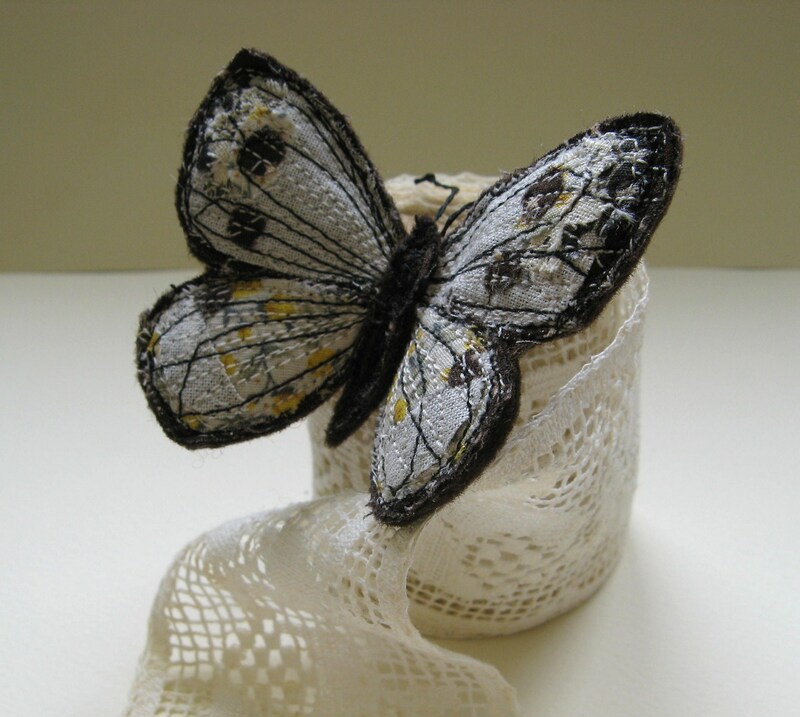 The wings are covered with layers of machine stitching and the butterfly is slightly padded and backed with felt. 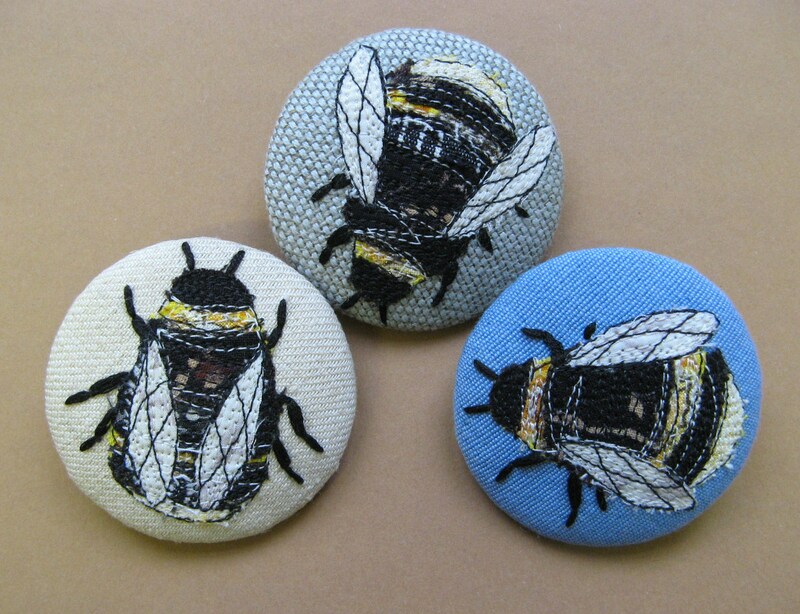 The antennae are made from strong button thread. 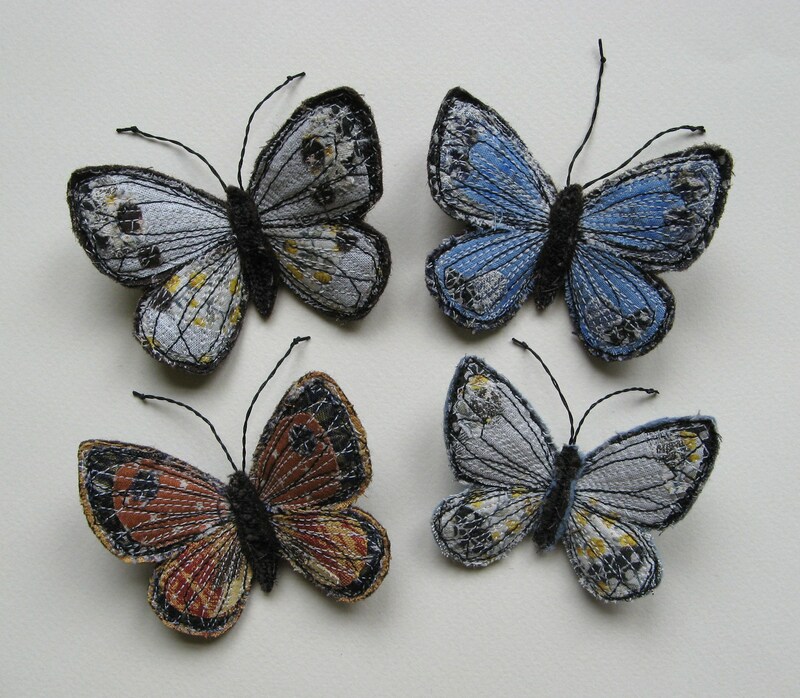 These butterflies can be worn as a brooch but I think they would also look lovely pinned into a little box frame. 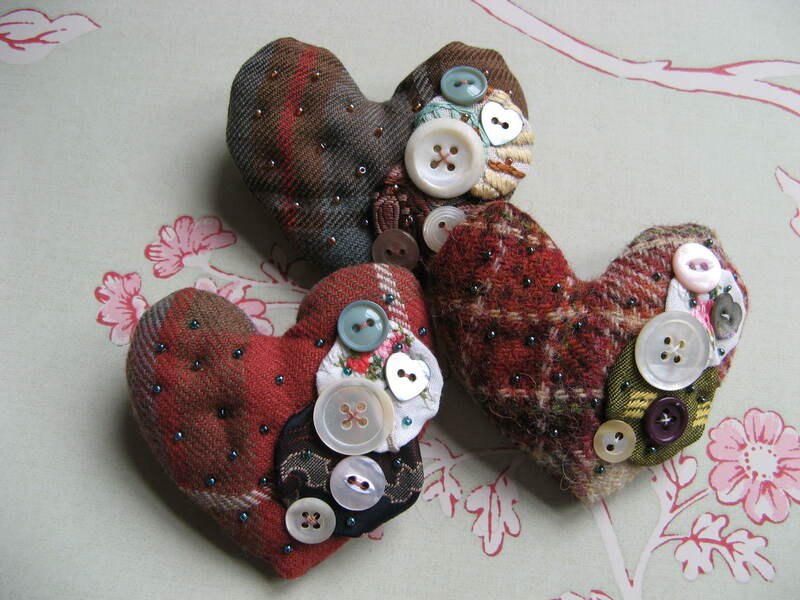 These three will be listed on my Etsy shop, although one has been reserved already. 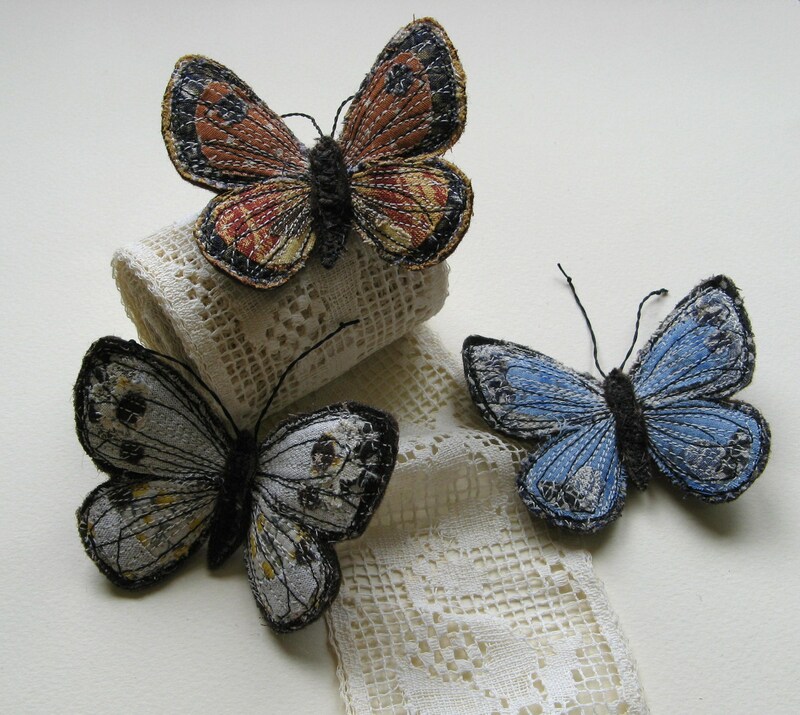 I`m definately going to make more, I`ve been thinking of some larger pieces and perhaps some 3D butterflies incorporated into mixed media embroideries. 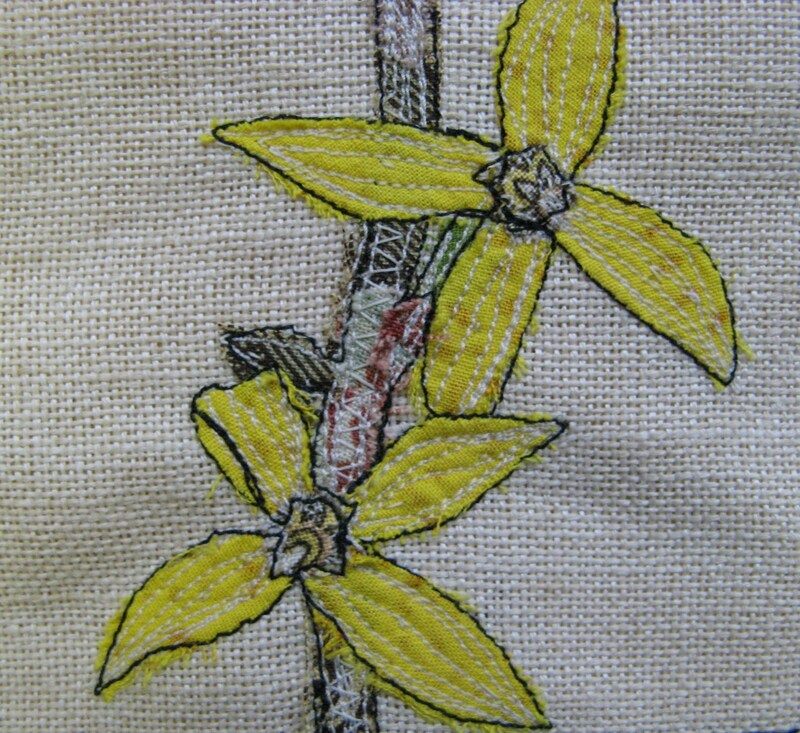 Inspired by my forsythia drawings, I made this little stitched sampler this week. 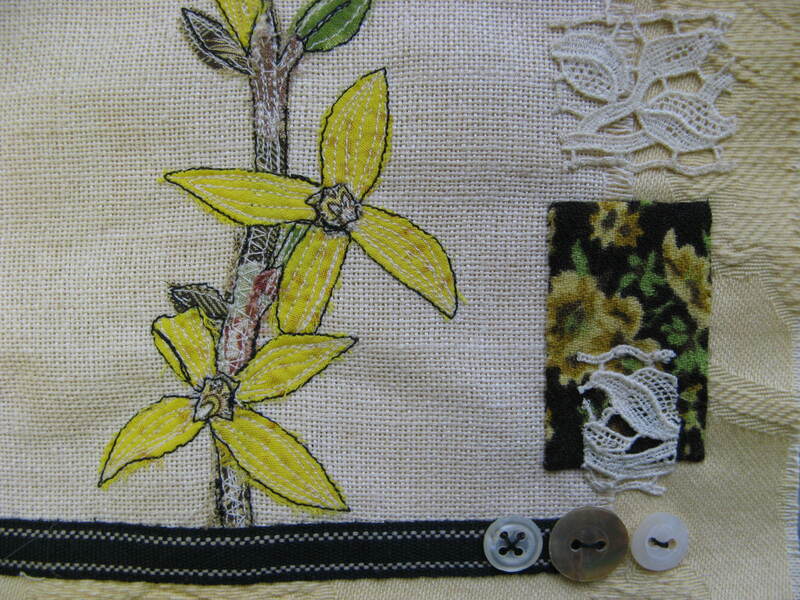 The forsythia twig is ‘drawn’ on some loose woven, vintage linen, framed by scraps of toning cottons, vintage lace, cotton tape and shell buttons, all sewn onto a small piece of pale yellow recycled furnishing fabric. 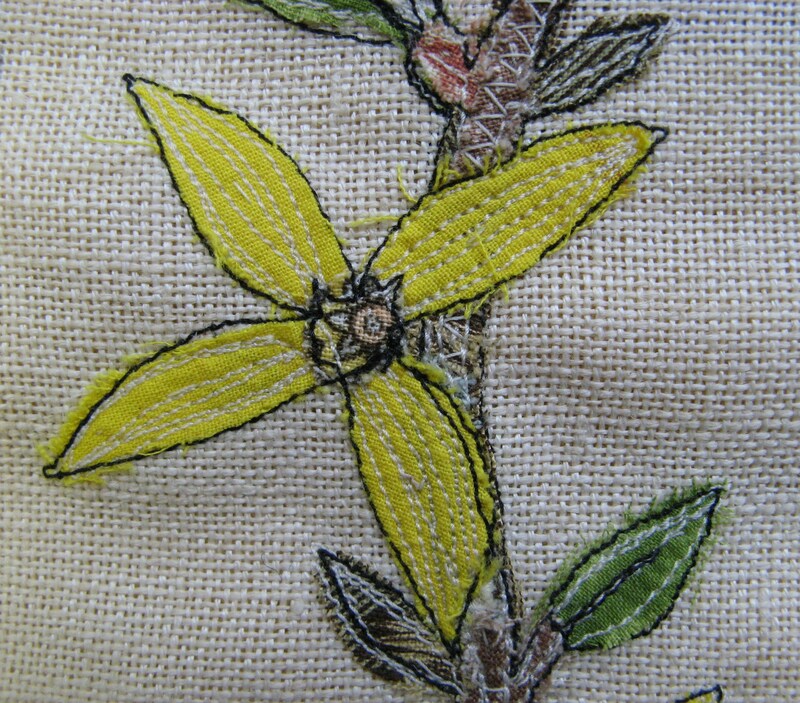 I want to experiment with lots more botanical stitching, based on drawings, I`ll just play around with little samplers till I feel I`m getting it right. 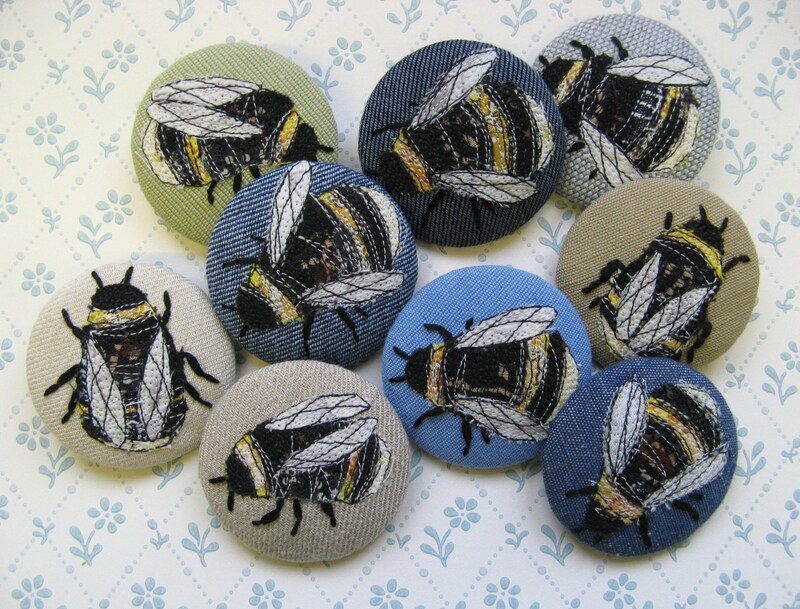 I`ve just spent the last couple of days making some more bumble bees brooches and I`m really pleased with the results. 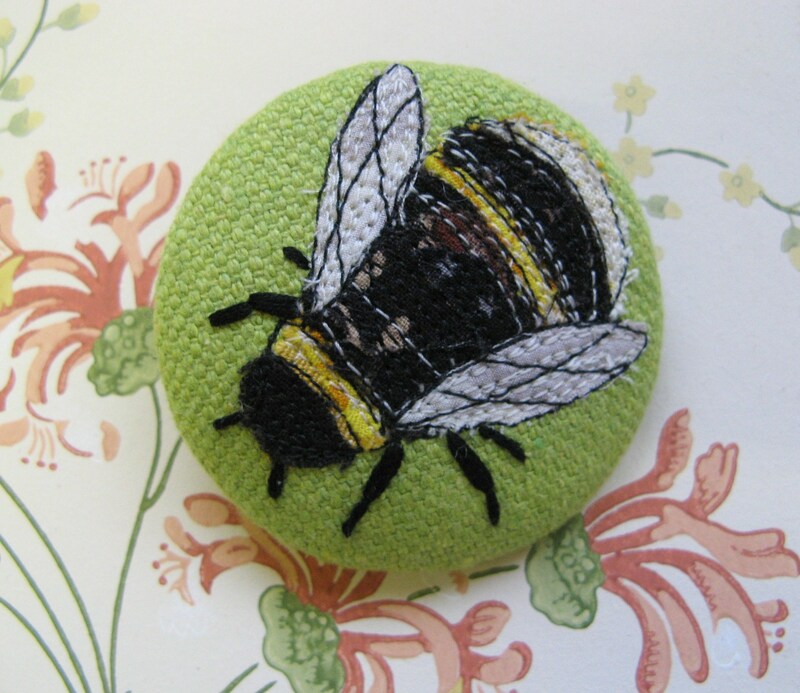 I used the drawings I did last year for inspiration again, but I let these ones ‘evolve’ as they were being made which means that they are all slightly different. 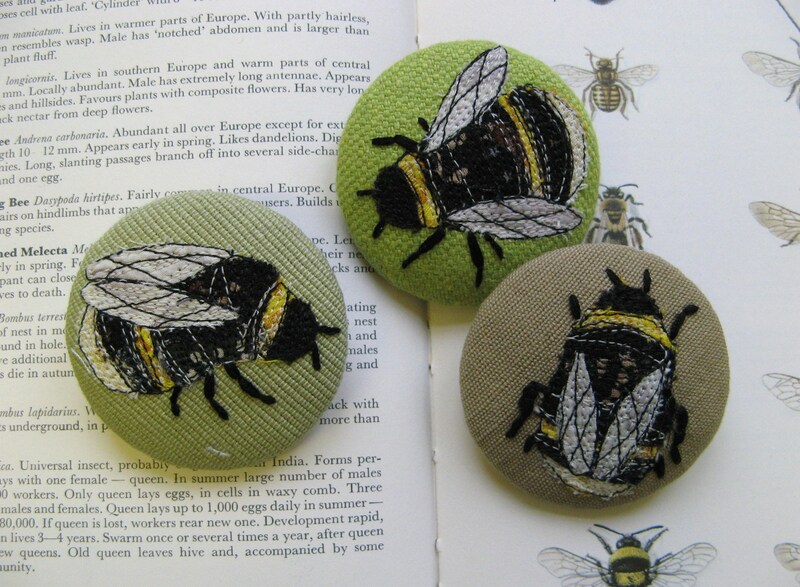 They really seemed to come ‘alive’ when I embroidered their little legs, I took care over the angle of their legs to try and suggest movement and to give them a sketched feel. 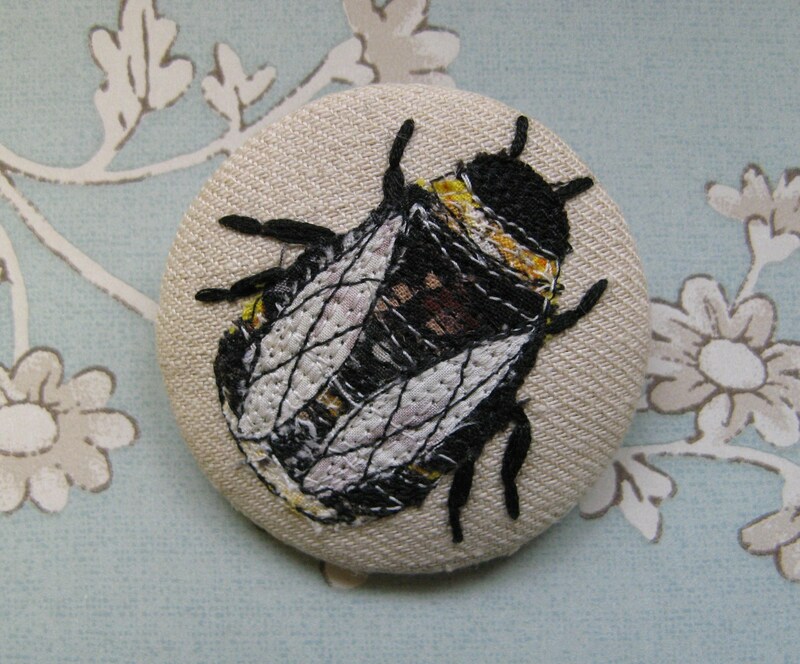 I really love their textures, I think the layers of fabric scraps and stitching give them a lovely furry look. 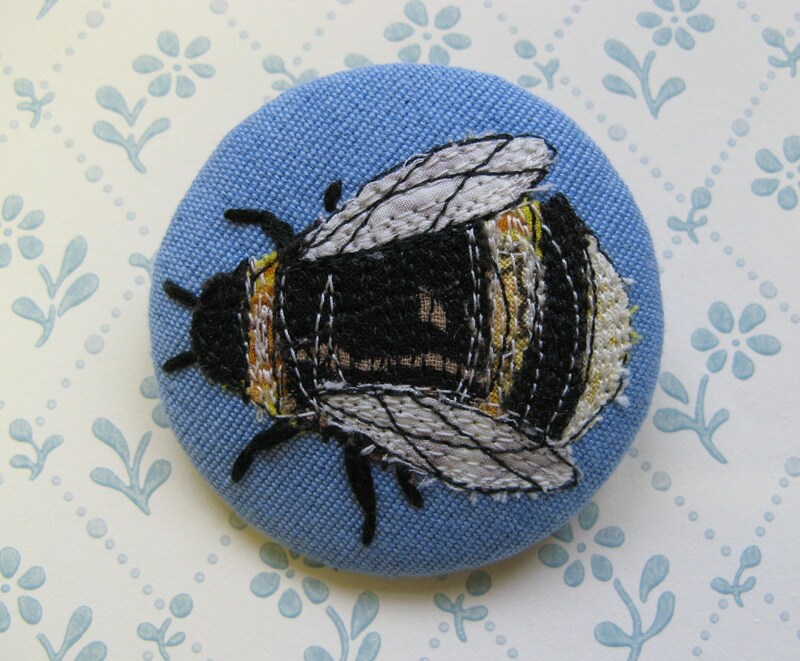 It`s been such a cold Spring so far that I haven`t spotted any bumble bees in the garden yet, but I`m looking forward to seeing them soon. 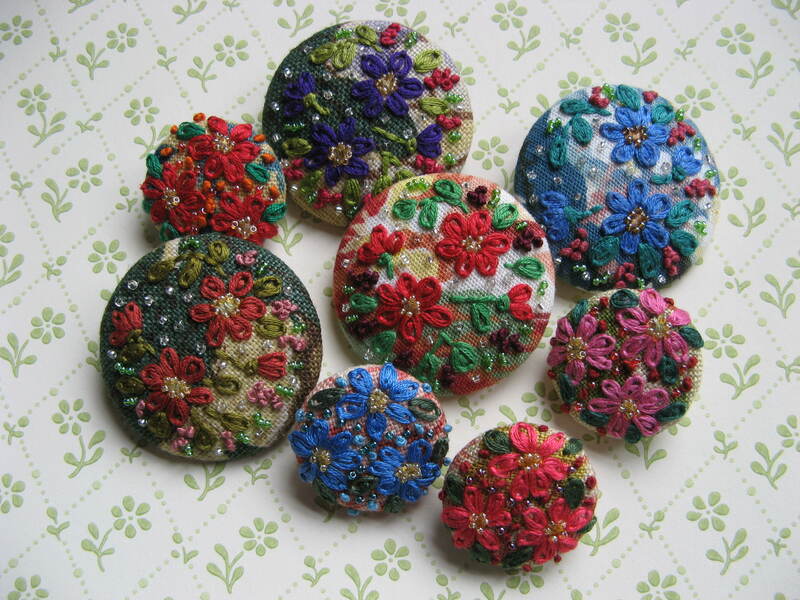 These are some new little daisy brooches that I`ve been working on this week. 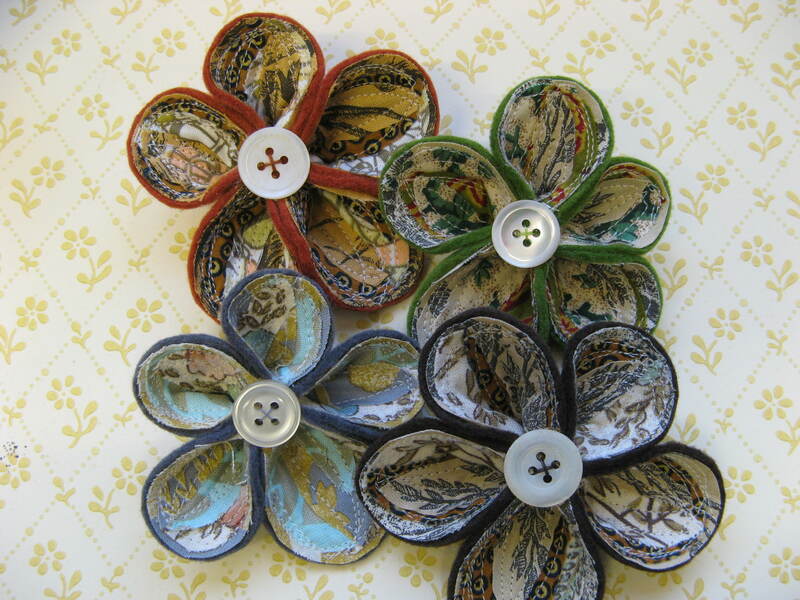 Tiny scraps of vintage cottons have been layered on to felt to create the petals. 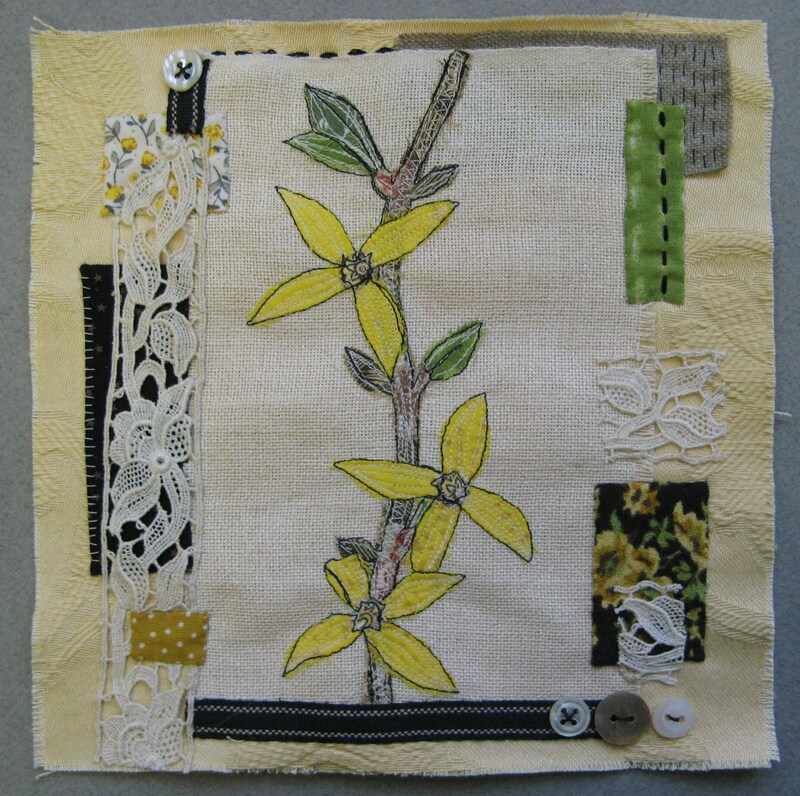 I seem to be working this way more and more, layering and blending fabrics the way I do with papers. 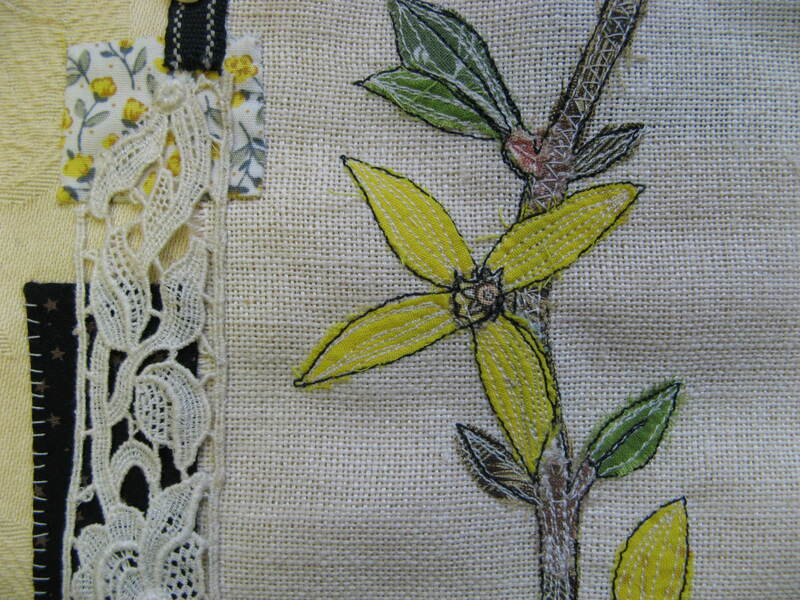 I like the way that the paper side of my work has naturally started influencing the fabric side. 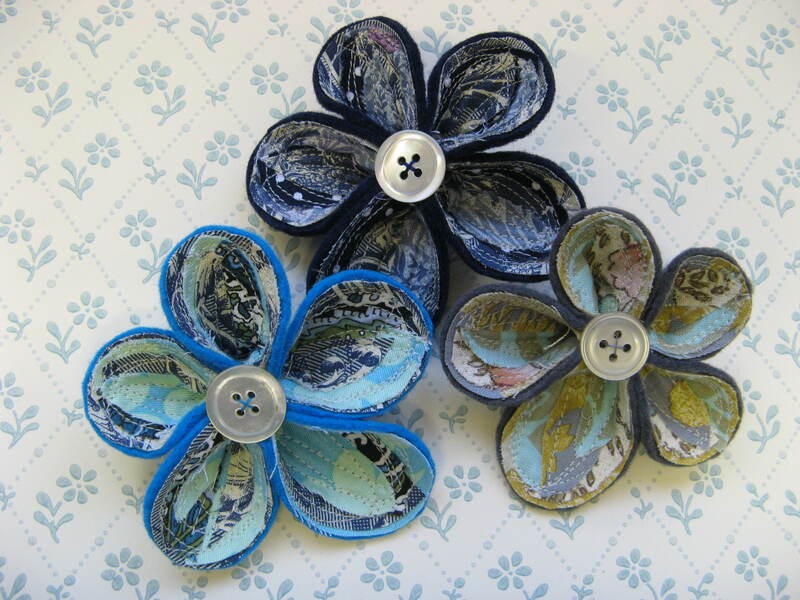 I love the collagey, fragmented feel that it gives to these flowers. 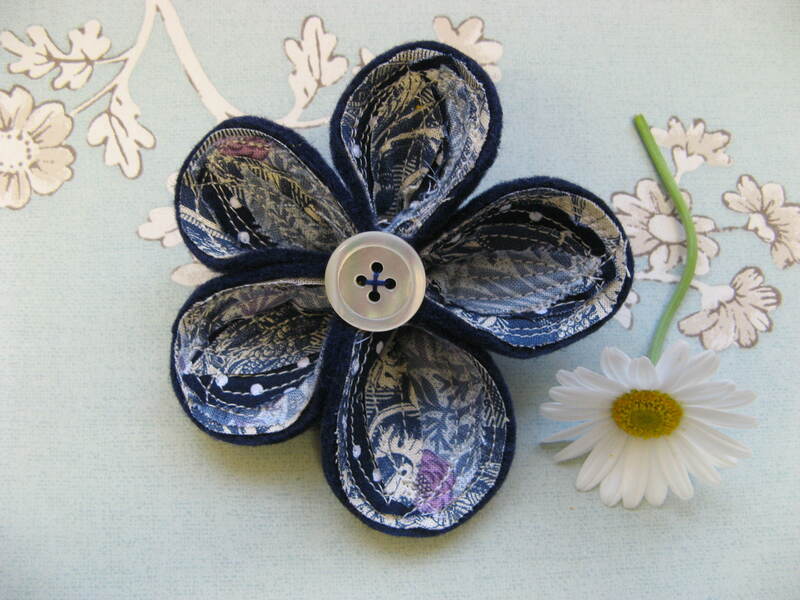 The daisies are finished off with a vintage shell button at the centre. 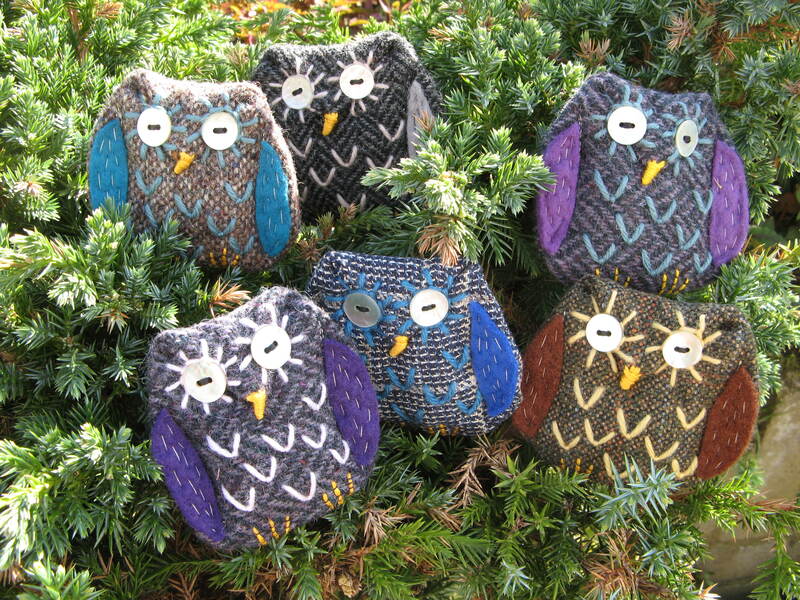 They are deliberately asymmetrical to give a cute, quirky look. 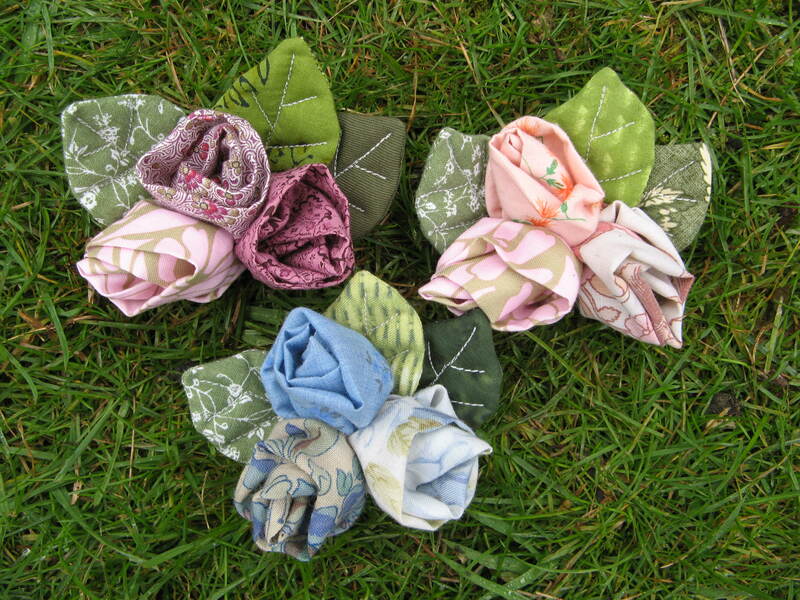 I`ve become a bit addicted to making these flowers over the last couple of days, it means I can dig out my collection of cotton scraps and have a good play, mixing and blending colours and patterns, something I really enjoy doing! 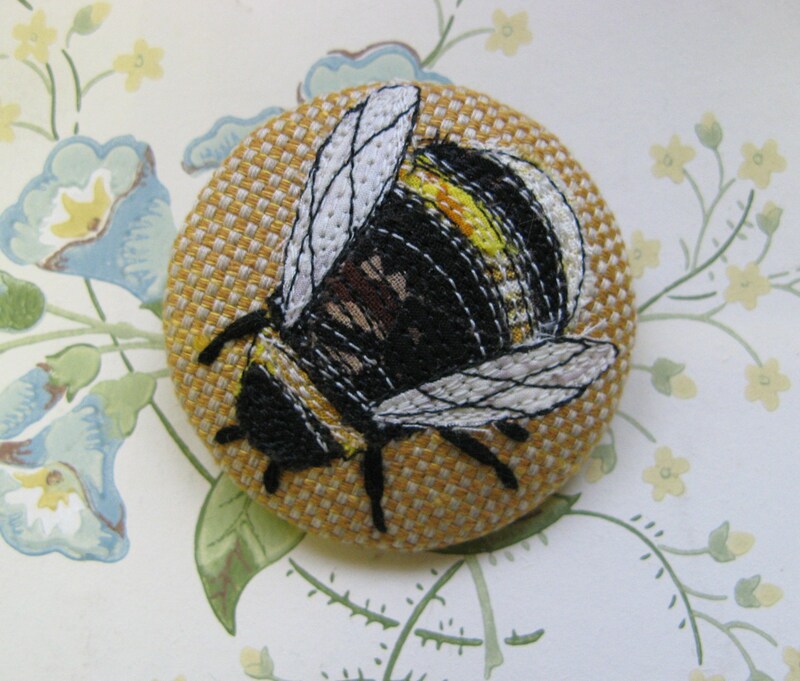 I`ve just had a busy two weeks, making stock to top up Flux, the Lucie Fenton Gallery and Miss Katie Cupcake, plus working on a collection for a new stockist, The Wild Thistle in Braemar. 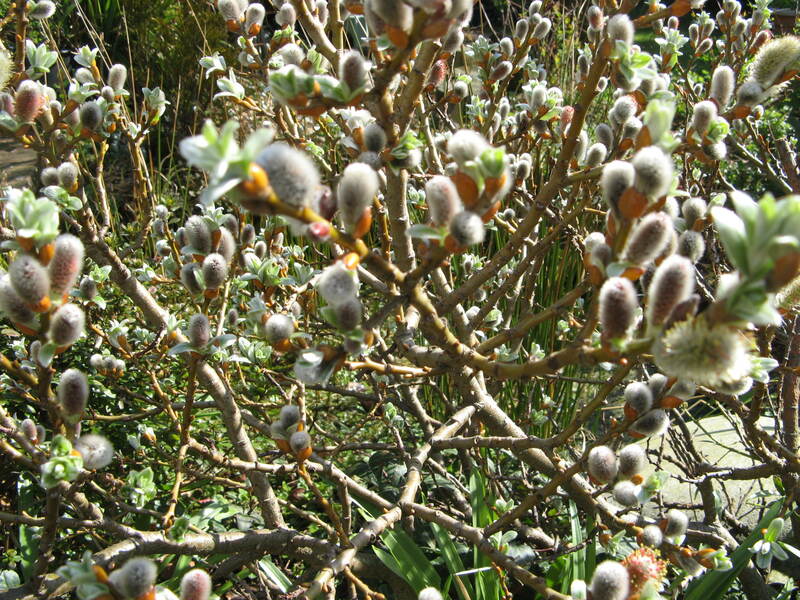 What a complete contrast the two weeks were! 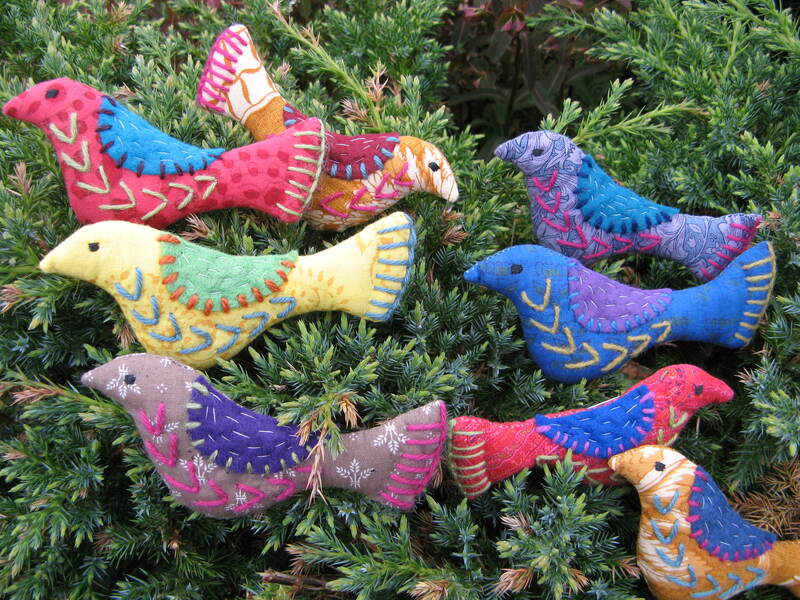 The gorgeous first week felt like we had by-passed Spring and gone straight to Summer. 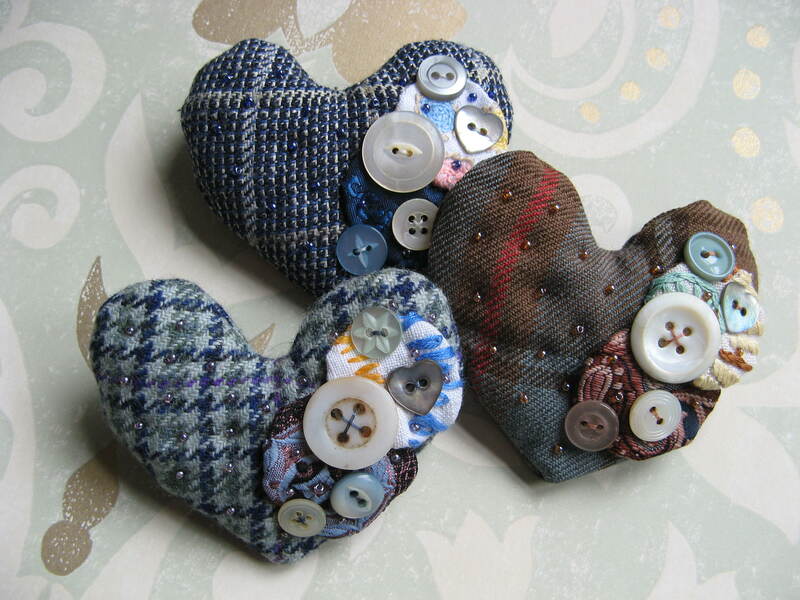 I spent long days in the garden, sewing in the sun. 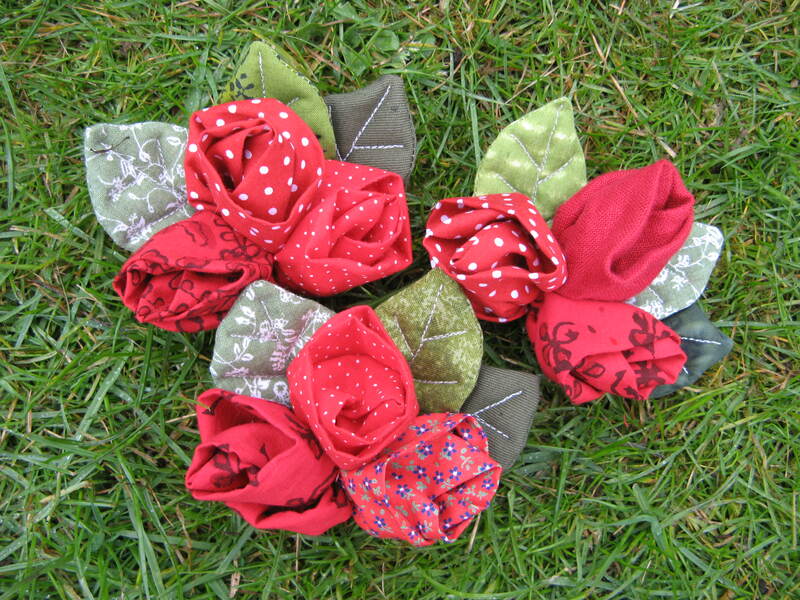 I love sewing in the garden, surrounded by birdsong with my trusty radio at my elbow (radio 4 all day!). 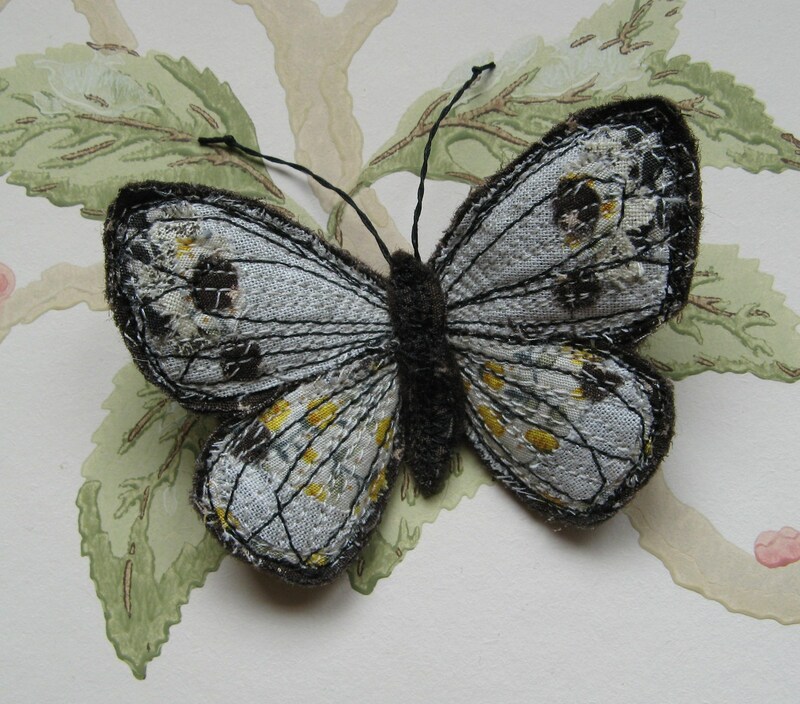 Then last week I was huddled next to the radiator, watching snow falling outside! 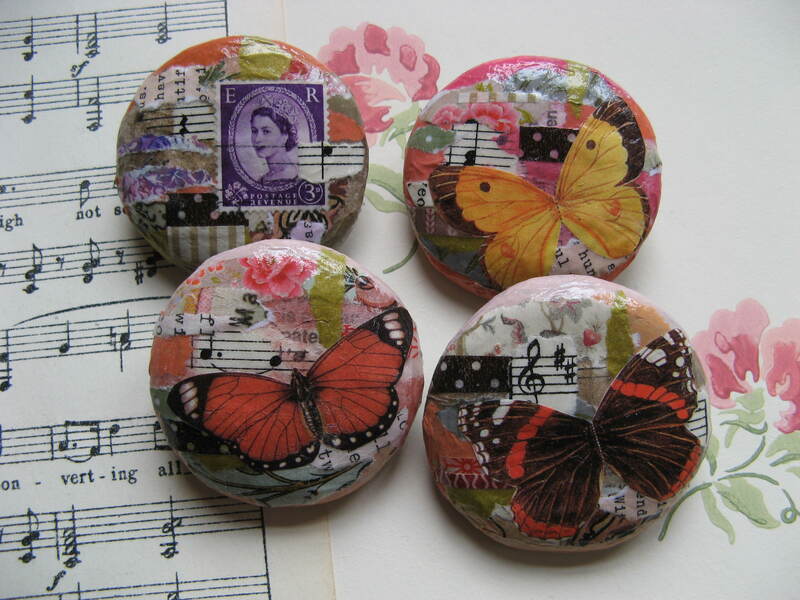 I made a huge batch of decoupage brooches. 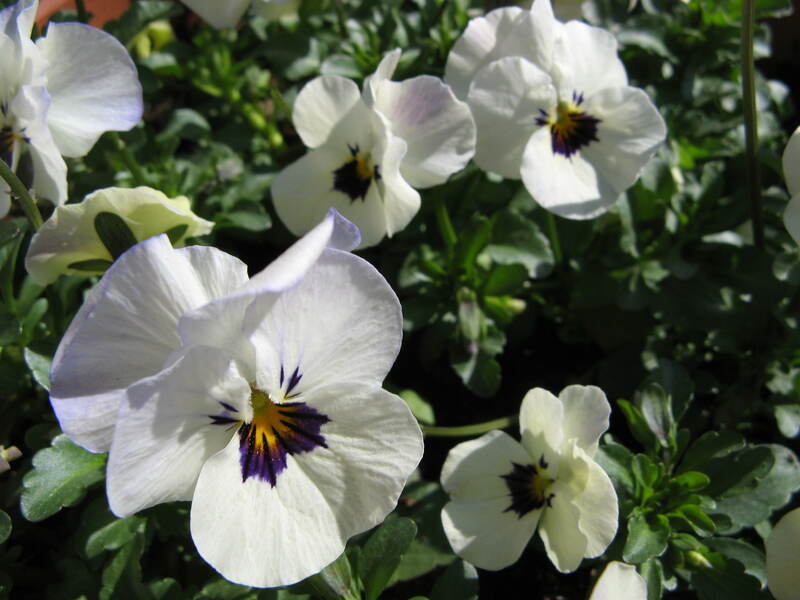 Sticky fingers all week! 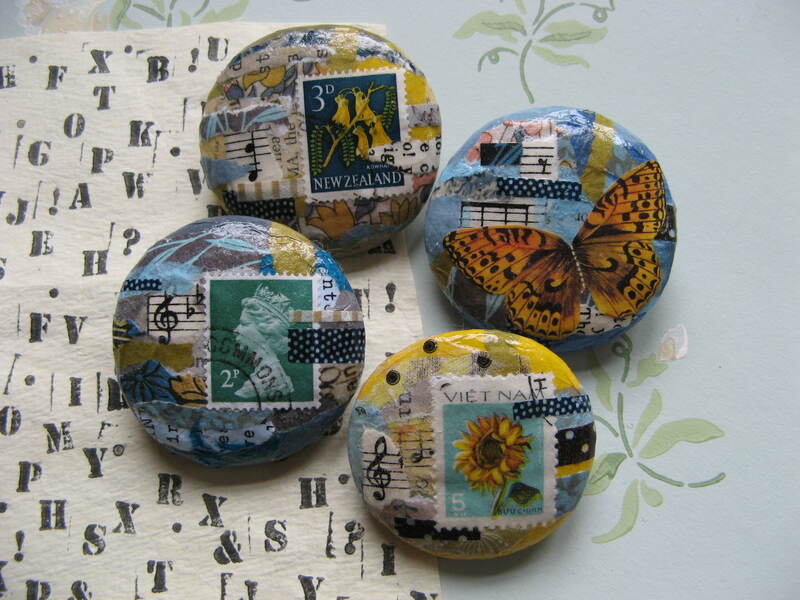 I`ve been using a lot more stamps with this batch. 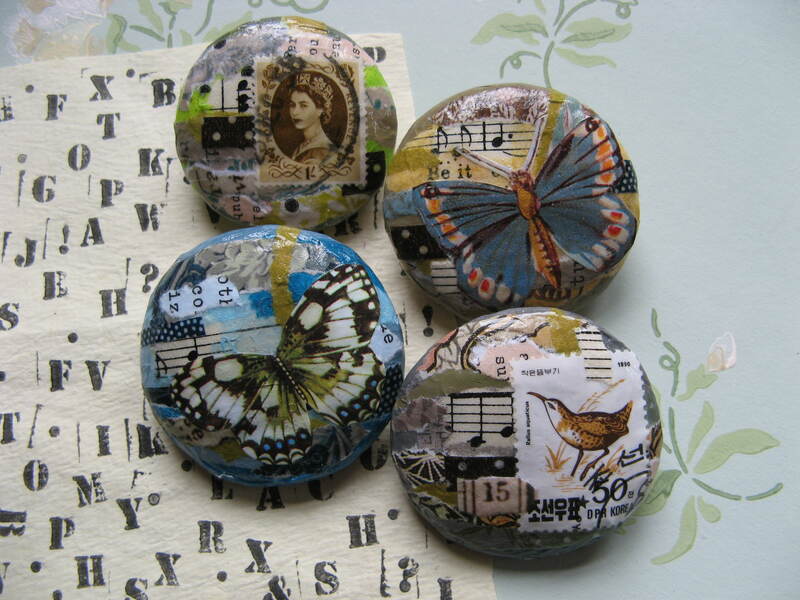 I made some using Queen`s head stamps to celebrate her jubilee. 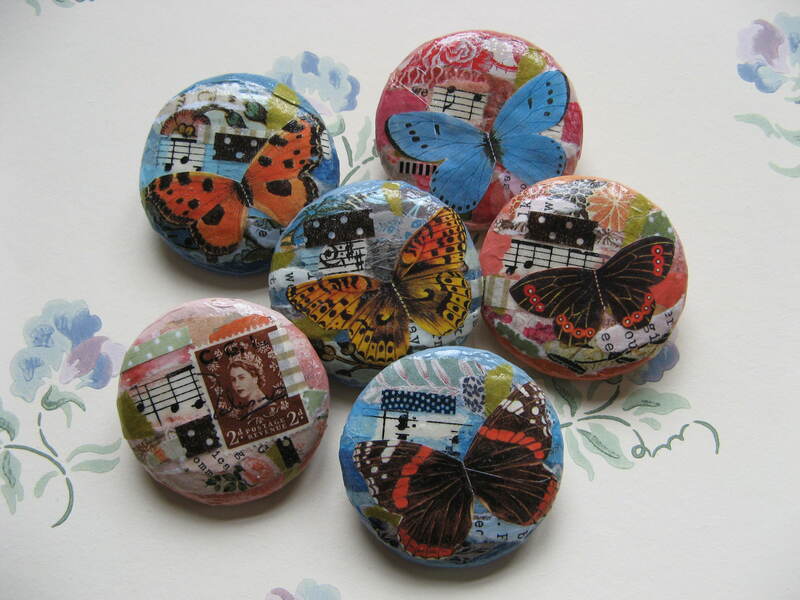 I even did a version of red white and blue. 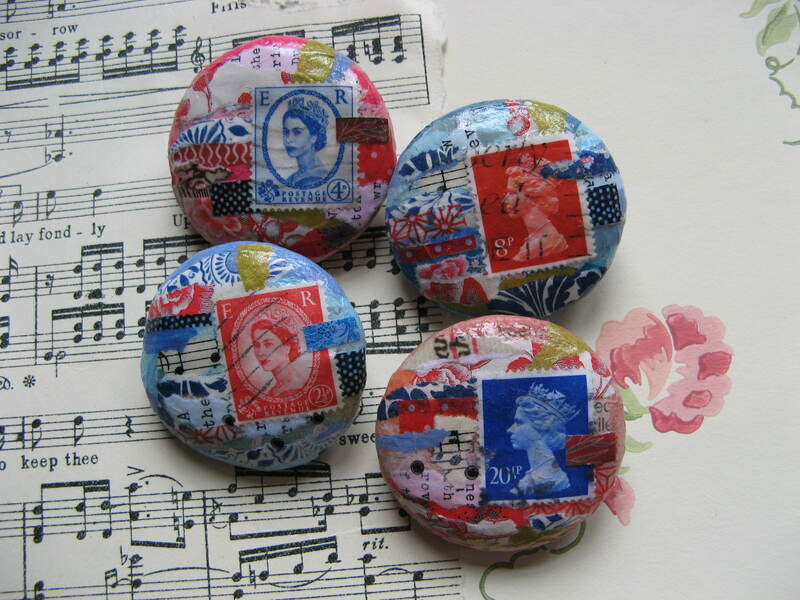 The Queen looks so beautiful in these 1950`s stamps. 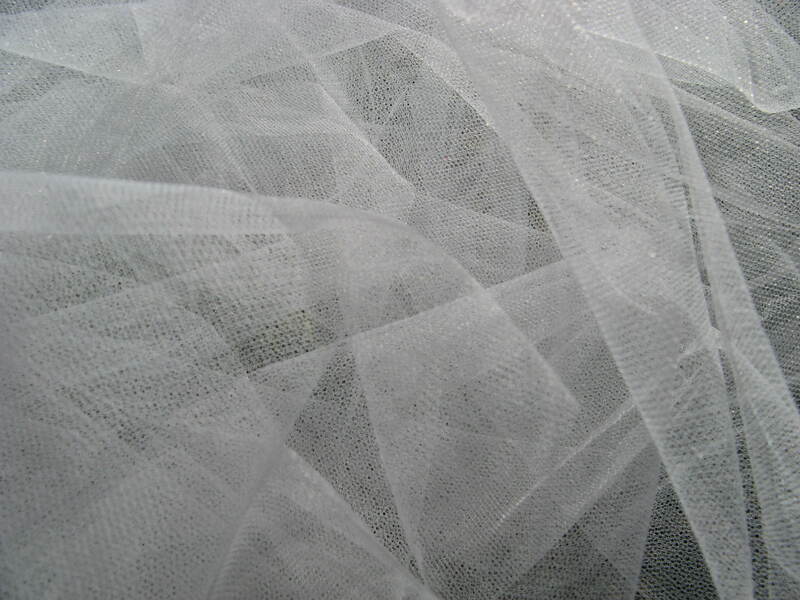 I saw this gorgeous tulle in palest oyster in John Lewis a couple of weeks ago and bought half a metre to have a play with. 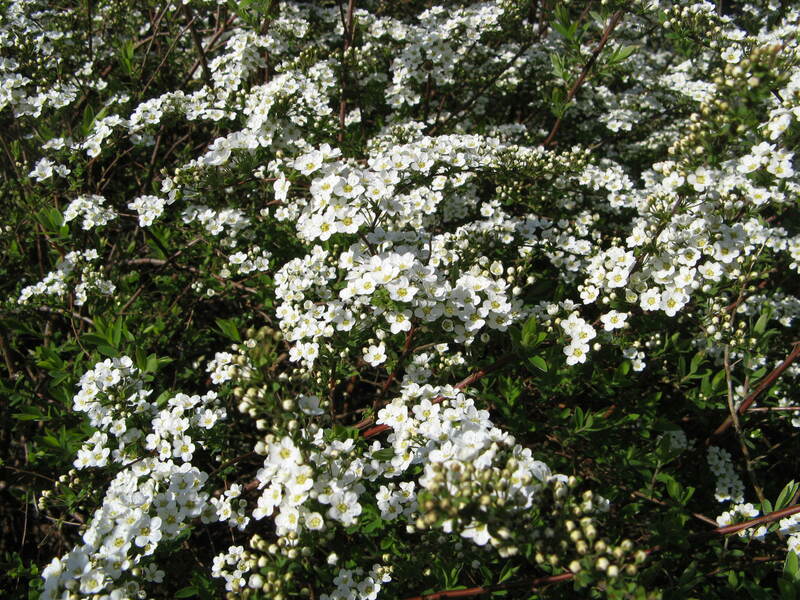 It coincided with lots of white flowers appearing in the garden. 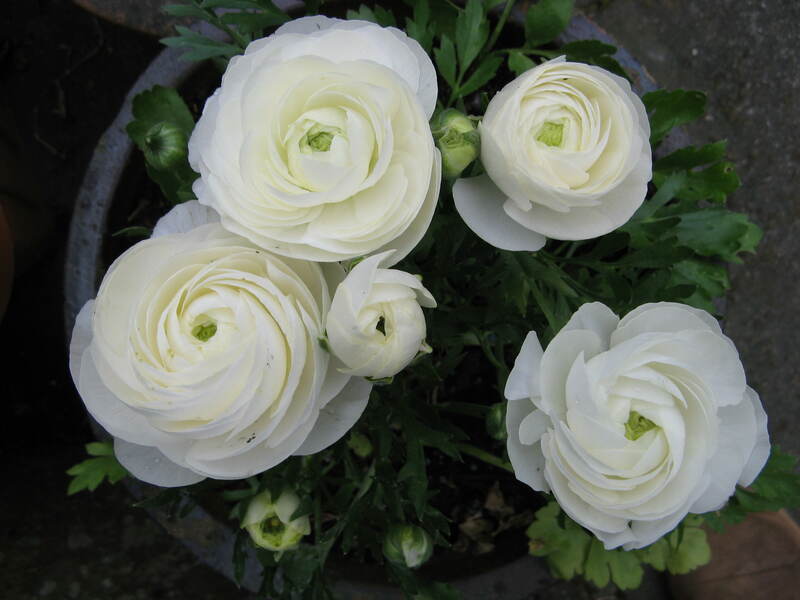 I love white on white, so fresh and pretty and really evocative of Spring. 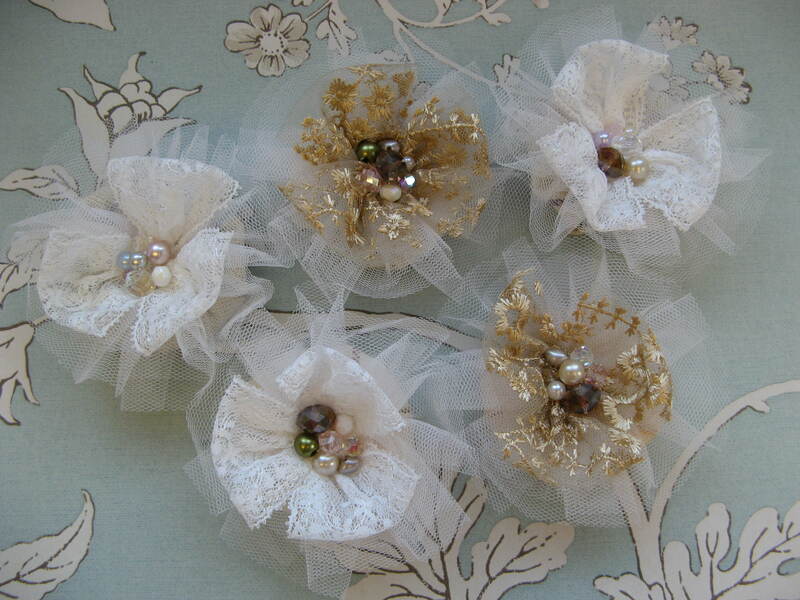 I made these pretty corsages while sitting out in the garden, basking in the warm sun the week before last. 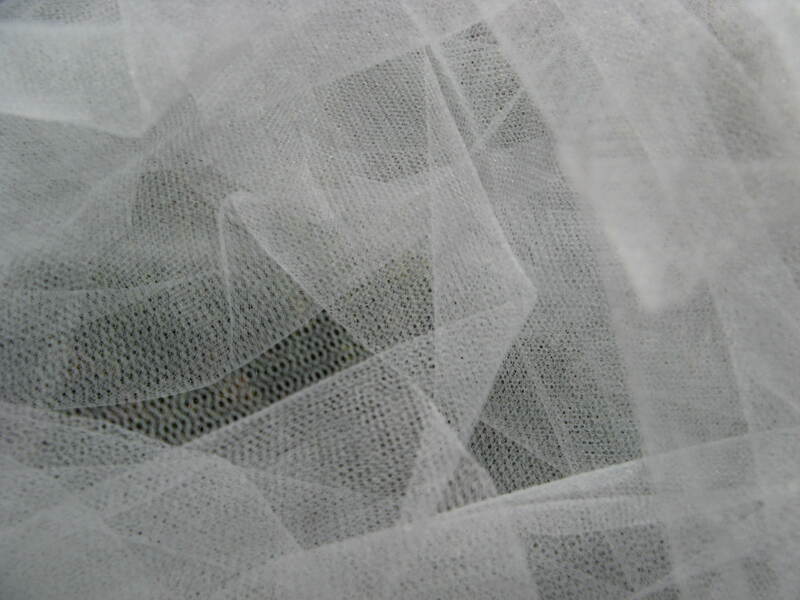 They combine recycled linen with the tulle and vintage lace, with a cluster of vintage crystals and pearls in the centre. 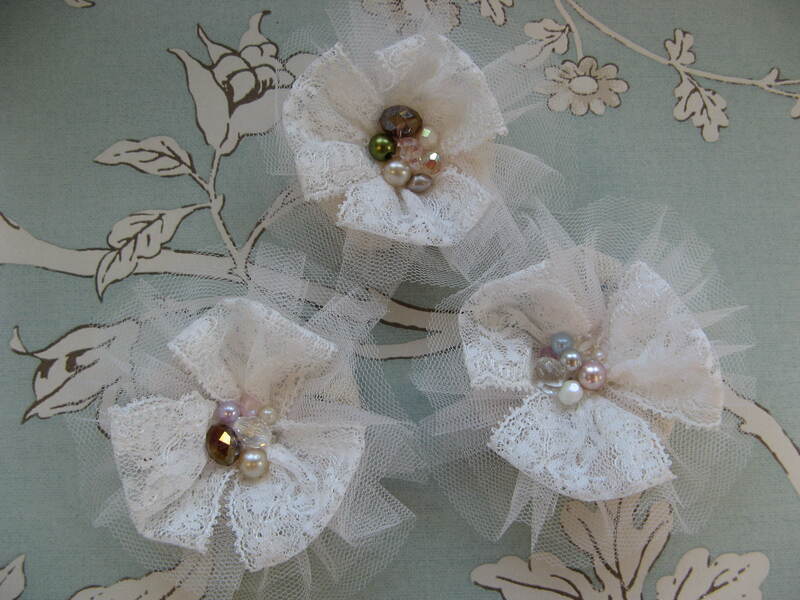 Very sweet and pretty, just right for a Spring wedding. 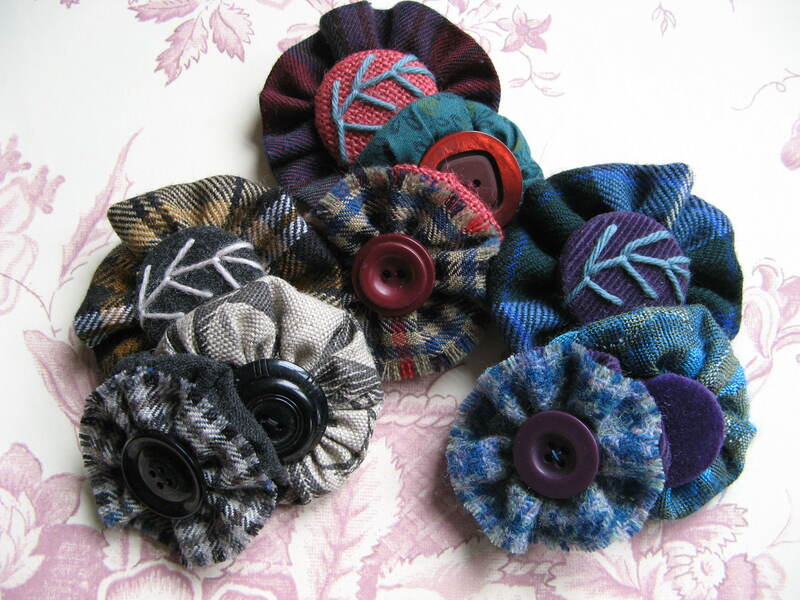 Making them really fitted in with the gorgeous weather of that week, then last week we had white on white of a different sort- snow blizzards and hail!